If you're looking for an all stainless exhaust system that not only looks good, but also doesn't sound terrible, you've come to the right place. 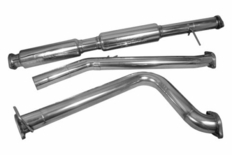 Injen SES Stainless Steel Exhaust Systems are all made from 100% 304 stainless steel. No cheap materials that rust out in a year or two. CNC mandrel bends, machined flanges, and robotic TIG welding mean your new Injen Exhaust will bolt right up in your garage. You won't have to cut or rig anything. Simply remove your factory exhaust system, and put this in its place. All of the stock mounting locations are used. You'll be done in an hour or less. Injen Exhausts have a deeper sound than those cheap tin can sounding exhausts. They are optimized for the best horsepower gains and exhaust flow. Their decibel rating is under the legal limit, and they are street legal in all 50 states. 3" diameter. The part number for this exhaust system is SES5042 and it fits 2013-2016 Dodge Dart 2.4 4Cyl models.